Powered by an upgraded 4.4-liter twin-turbo V8, the 592hp BMW M5 should shred tarmac and tires alike. 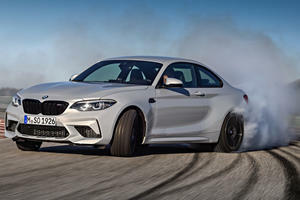 But for the first time ever, all-wheel drive is standard – under the moniker M xDrive – with an option RWD-only mode. 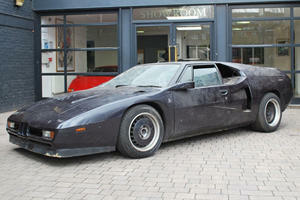 Gone is the DCT, replaced by an M-specific 8-speed automatic gearbox. The launch-specific, limited run, M5 First Edition features Frozen Dark Red Metallic paintwork and carbon ceramic brakes as standard. Optional safety equipment includes adaptive cruise control, and a range of semi-autonomous aids. This is it, the latest fire breathing M5 super-sedan from BMW – codenamed F90. The iconic businessman’s sports sedan, the M5 has been lauded through its history as the ultimate driver’s machine from BMW. This time around, there’s a ‘but’… For the first time in its history, and BMW’s for that matter (notwithstanding the X5M and X6M), the new BMW M5 has all-wheel drive. Sacrilege! The reasoning behind the move is that the M5 is now too powerful for anything else, so the beast needed to be put on a leash. Chained or not, the BMW M5 is aiming at nothing less than total destruction of Audi’s RS7 and Mercedes-AMG’s E63S. The M5 builds on an already impressive 5 Series interior. There’s space for 5 in a roomy, comfortable environment, with an interior design familiar to anyone who’s been in a BMW from the last decade. Material qualities are of the highest standard, and soft-touch materials are everywhere in here. The centerpiece of the dash is BMW’s latest iDrive infotainment system, now with a touch screen, a new tiled interface, and optional gesture control. Bespoke for the M5 are an M steering wheel, complete with red M driver mode buttons, and M-badging. The Centre console gets upgraded with an M5-specific gearshift lever and bright red buttons to control the engine and transmission responses, damping, and steering setups. But the best interior upgrade has to be the gorgeous M Multifunction Seats, with enhanced styling, support, and bolstering to not only look good, but keep you in place on the track. Adaptive dampers, standard on the M5 ensure that ride can be adjusted to suit whatever surface comes your way. Adjustment on the dampers can matched by changes to the electronically power-assisted steering, to add or reduce weightiness to the wheel. Of course the big news is the M xDrive all-wheel drive system – but in true BMW form, the system is rear-biased. It features three modes, available with a combination of ESC modes, to allow for controlled all-weather driving, enhanced driving dynamics, and all-out hooliganism. 4WD offers you the most composure and grip, while still retaining a sense of a RWD chassis. 4WD Sport, accessible in M Dynamic Mode only, uses the active rear M differential to send more power to the outer rear wheel to reduce understeer. Switch the DSC off though, and you have the option of 2WD mode – pure, unadulterated rear-wheel drive for all the smoky drifts you can dream of. 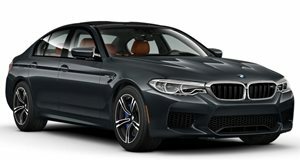 The BMW M5 uses an upgraded version of the S63 4.4-liter twin-turbo V8, tuned to crank out 592 American horsepower and 553 lb-ft of torque, the latter available from as low as 1800rpm. Gone is the M-DCT transmission, and in its place an M-tuned 8-speed automatic from ZF, transmitting power to all four wheels. The power, torque, and AWD combine to produce a 0-62mph sprint of 3.4 seconds, with 0-124mph taking just 11.1s. 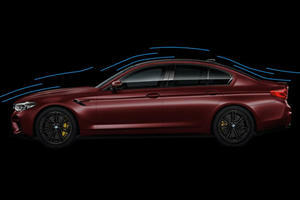 Top speed is limited at 155mph, but with an option marked as the M Driver’s Package, that figure gets lifted to 190mph. Weight savings is key to the M5’s speed, and is brought about by a carbon fiber reinforced roof, and liberal doses of aluminum. M-Compound brakes are standard, but can be optioned up to carbon ceramics, with gold calipers, to save an extra 23kg. 19-inch alloy wheels are standard, though 20-inch ones are available. The M5 can also be equipped with any and all of the 5 Series’ semi-autonomous functionalities. The F90 BMW M5 is yet to be crash tested, but the underpinning 5 Series is an IIHS Top Safety Pick+ and scored 5/5 stars in NHTSA testing. All-wheel drive won’t dampen the BMW M5’s hunger or ferocity. Make no mistake; the M5 is here to lunch drag strips and lap times alike, leaving Audi and Mercedes-AMG in its wake. The 5 Series may be soft, but the M5 turns the dial up to eleven.